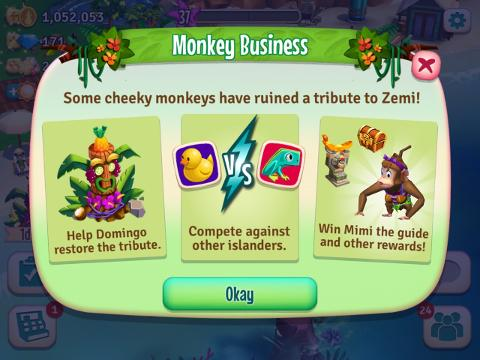 Domingo wants to make an idol from various rare items he’s found on the island, that he wants to dedicate to Zemi. 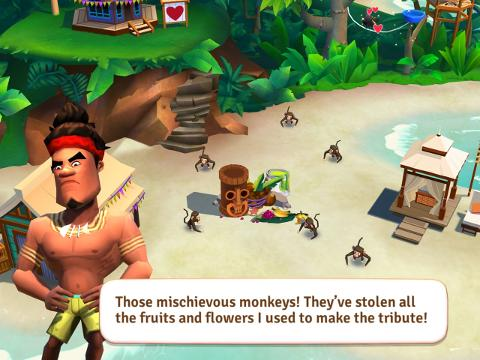 However, mischievous monkeys have run away with all the items he’s found, and Domingo’s angry and frustrated. He tried finding the monkeys and talking sense to them, but they’re nowhere to be found. So he’s decided to ask all his friends to help him bring those items back. 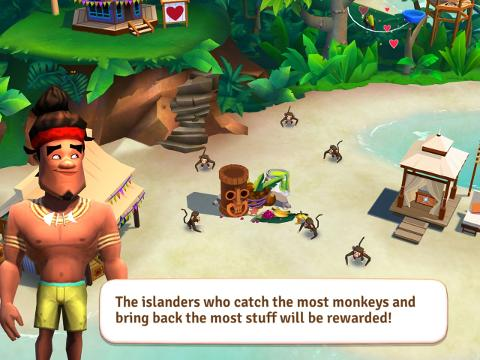 You and every other Tropic Escape player volunteer to help catch these monkeys to get back the items and help Domingo re-build his monument. The ever-grateful Domingo is looking to reward the person who has helped out the most! 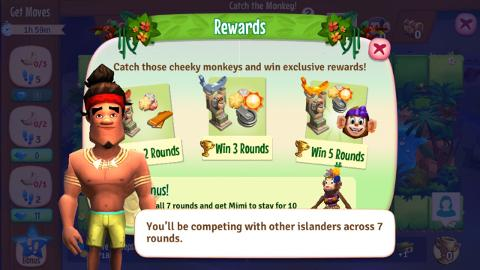 If you’re at least level 9, you will receive a pop-up to the Catch the Monkey event. You will need to force-close the game to see the update, or even reboot your device. Earn moves by crafting one of the available recipes within the next 2 hours. 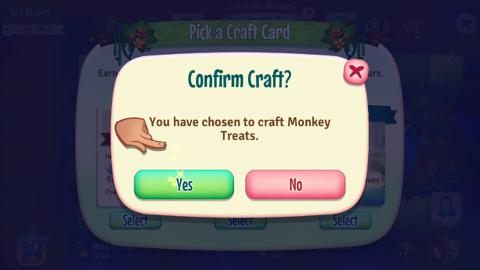 You can tap on the craft card for more information. 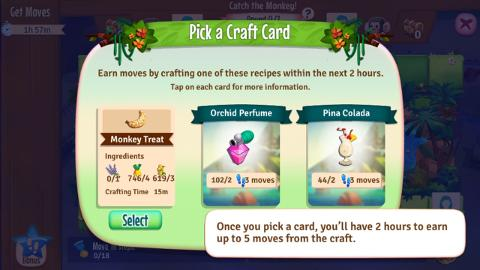 Once you pick a card, you'll have two hours to earn up to five moves from the craft. 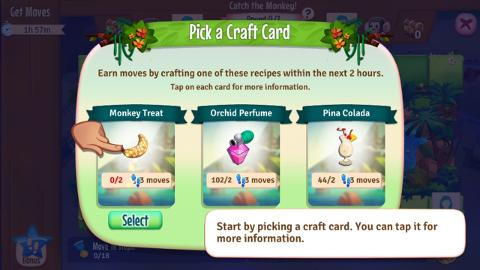 You will have to pick a new craft card each time you spend your moves. 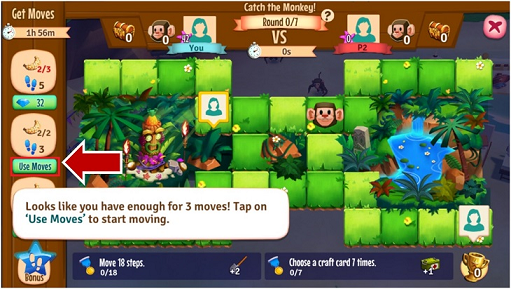 Use the moves you earn in catching the monkeys! You can tap on the "Use Moves" icon if you are stuck or to move ahead. 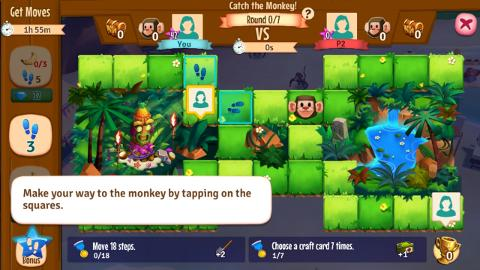 Make your way to the monkey by tapping on the squares. 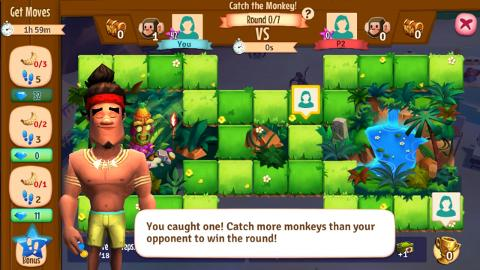 The player who has caught the most number of monkeys by the end of the round is the winner of that round. Players get rewards depending on the number of rounds won at the end of the event. Earn GOLD by winning five rounds to win Mimi the guide among other rewards! Win 7 rounds to get Mimi to stay for 10 additional days!